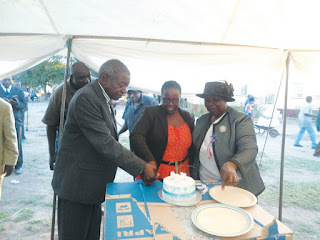 MWENEZI - The Mwenezi Rural District Council (RDC) last week held a farewell party for former Chief Executive Officer (CEO) Stanslas Mavesere who retired from his position in February. The function, held at Neshuro growth point, saw Mavesere walking away with an assortment of gifts and cash prizes from individuals and various institutions. Speaking at the occasion, president of Rural District Councils Dr Killer Zivhu, who was the guest of honour, hailed Mavesere for his sterling work in the council and warned all rural councils not to back track on developmental programmes as dictated by the ruling Zanu PF party. "Retiring from your position does not mean that you are no longer part of us….your (Mavesere) visionary leadership brought a number of developments in Mwenezi and beyond….we will continue to engage you where we need advice. To Zanu PF councillors, as we head to 2018 elections, we have no mercy upon anyone who jeopardises the party's 2018 victory. Kana wafunga zvokutamba, tamba nezvimwe, kana kutamba zvako nevakakubereka haikona kutamba nemusangano weZanu PF," said Dr Zivhu who also pledged gifts for Mavesere. Addressing delegates at the same occasion, Mwenezi RDC chairperson Samuel Masukume said considerations will be made so that if possible, one of the streets in the district areas that are undergoing development would be named after Mavesere.